I am a busy Mom but that doesn’t mean that I don’t love to put together a cute outfit. I’ve been wanting to feature more of my personal style on Conflicted Pixie but have been putting it off because, let’s be honest, no one really wants their photo taken after having a baby. Well, my little lady is almost 5 months old and I am feeling pretty good so, on the way to the playground, my hubby snapped some photos of my outfit. I am a big fan of pattern mixing - I do it almost everyday even when I am super casual. This embellished tee pairs perfectly with a button down and my short sleeved trench coat (actually it is a dress...shhhh) was the perfect topper. 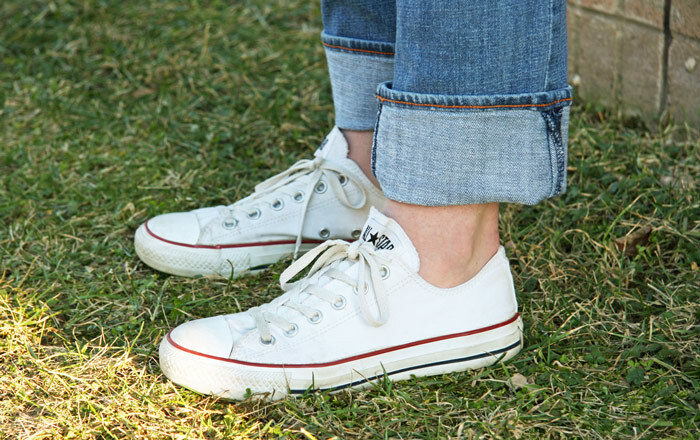 Cuffed denim and white converse are my casual staples. Here's a little photo shoot outtake. We REALLY were on the way to the playground. The girls were such good sports despite Blake's expression.